This article is about the transformation of Yoshis after touching a Morph Bubble. For other uses, see Submarine. Power(s) given Move through water, shoot torpedoes. 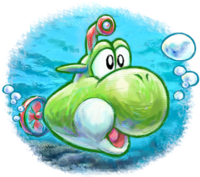 Submarine Yoshi, also known simply as the Submarine, is a form that the Yoshis can transform into in Super Mario World 2: Yoshi's Island by touching a Morph Bubble containing its picture. The form has a discrepancy between the official artwork and its sprite in the first two Yoshi's Island games it appears in: the official artwork portrays the submarine having Yoshi's face on it while the sprite of the submarine is designed to be more realistic with simply Yoshi's eyes on it. In Yoshi's New Island, the discrepancy is gone as the model matches the official artwork. The Submarine form can be used to dive through bodies of water, since normal Yoshis are unable to dive, and fire homing torpedoes at enemies. Getting hit in this form causes the player to briefly lose control of the Submarine, making it more difficult to reach the Yoshi Block before the transformation's time runs out. The Submarine reappears in Yoshi's Island DS, appearing exclusively in the Island of Peril level of World 3. It is no longer able to launch torpedoes, however. In Yoshi's New Island, the Yoshi must enter a Whirly Gate with its picture to become Submarine. It works similarly to the original, except that the player must tilt the system to steer it. 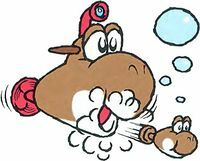 Although the torpedoes the Brown Yoshi launches in the Submarine's official artwork resemble Yoshi faces with a propeller on the back, the torpedoes seen in the game resemble regular torpedoes. Despite the Submarine's artwork shown above being brown, Brown Yoshi never gets the opportunity to morph into a submarine. The Submarine is one of the two forms of Yoshi that appear in all three Yoshi's Island games, the other being the Helicopter. This page was last edited on March 27, 2019, at 22:26.